TravStar1 Point Of Sale SystemManager's Work Station Additional SetupHow Do I Change the Tax Rate? This lesson will teach you how to adjust your tax rate percentages if your taxes change. 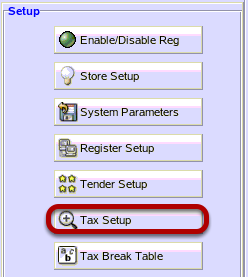 In the Setup Menu, click on "Tax Setup". 1) In your Tax Code list, click on the Tax Code you wish to change. Note: Some stores may have multiple Tax Codes that include a particlular tax rate. In this example, we will be changing the State Tax Rate for Tax Code 01. If the State Tax Rate exists in more than one Tax Code, you will need to repeat your changes in each Tax Code. 1) In the Tax Rate #1 field, type in the new tax percentage rate. In this example, 7.5 is 7.5%. 2) Select the "Apply" button. Prev: How Do I Require Cashier Password on Specific Register Functions? Next: How Do I Assign a Tax Rate to a Group Of Items?